Mortar Joints – Quality Block Co. Inc. 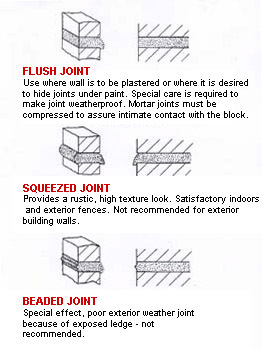 The type of mortar joint provides different architectural appearance. Weather resistance is a critical consideration in selection of joint type. 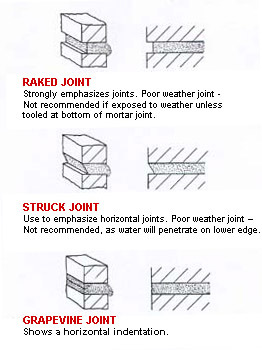 Joints with ledges (weather, squeezed, raked, and struck joints) tend to perform poorly in exterior applications…allowing moisture penetration. 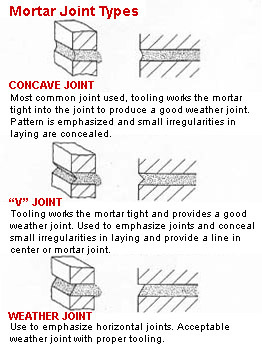 Tooled joints recommended for exterior applications…tooling compacts mortar preventing moisture penetration.